The new comment feature allows a user to send a message to a potential match before liking their profile. The message should be specific to that person’s profile, like “I also love Peruvian food” or “I’m obsessed with chihuahuas, too. 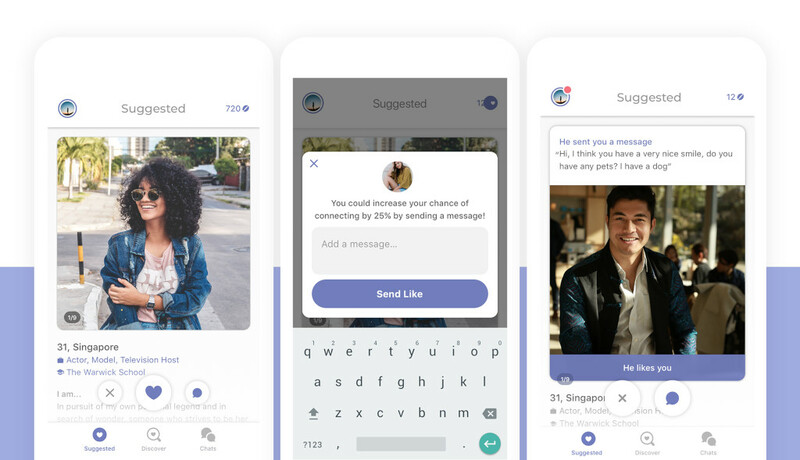 I have three!” Coffee Meets Bagel hopes this feature will address the issue of wasted time by giving users more opportunity to assess compatibility before becoming invested in a match. Kang said the commenting feature led to a 60 percent increase in total messages exchanged during testing earlier this year. Coffee Meets Bagel has also gotten a makeover. The company’s redesigned logo replaces the coffee and bagel icons of previous logos with the letters C and B interlinked to form a heart. The app’s bright blue and orange color scheme has been swapped for a softer purple shade, and the “pass” and “connect” buttons have been replaced with heart, chat, and x icons. Profiles now showcase more text and larger images. The app’s newly adopted minimalist vibe can also be found in its Discover and Suggested sections, which have been revamped to offer seamless scrolling and better navigation, respectively. Both sections are less cluttered than in previous iterations of the app. As part of this rebrand it looks like Coffee Meets Bagel also has launched a dating website, before this CMB only their service through Android and iOS apps. Users can log into the new site using their Facebook account. From there they can create a profile and communicate with matches. Most of the features of the apps seem to be available on the new dating website. Kang said Coffee Meets Bagel will be adding new features in 2019 to continue its mission of encouraging authentic and inspiring connections.